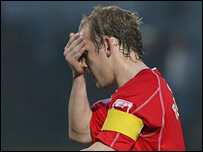 Former Wales strikers Neil Roberts and Chris Llewellyn are two of seven players released by relegated Wrexham. Wrexham captain Roberts, Llewellyn and midfielder Danny Williams have not been offered new deals by boss Brian Little. The experienced trio were a key part of the Wrexham side that lost the club its 87-year Football League status. Mike Carvill, Alex Darlington, Jamie Reed and Mike Jones have been released, while Wales defender Steve Evans, also out of contract, will know on Thursday. Wrexham manager Little, though, has offered new deals to highly-rated young winger Matty Done and full-back Carl Tremarco. The mass axing follows Wrexham's announcement last week where they let go 14 players in the wake of their relegation to non-league. Little then revealed Wales midfielder Mark Jones, former Northern Ireland international Jeff Whitley and Phil Bolland will not be retained. Five players have been transfer-listed, with Sam Aiston, Richard Hope, Michael Proctor, Silvio Spann and Anthony Williams going on sale. Loan signings Drewe Broughton, Richard Duffy, Paul Hall, Stuart Nicholson, Danny Sonner and Robert Garrett have gone back to their parent clubs. Wrexham could have held out for a nominal fee for Jones under existing rules, whose availability is likely to spark much interest from Football League clubs, as the youth product does not turn 24 until August. But the Dragons have opted to allow the player to make a clean split from his home-town club. A statement on the Wrexham website read: "After the sad events of the past week, manager Brian Little has made his intentions clear about reshaping the team for next season. "It really goes without saying that the club's finances will have to be revaluated as we step down from the Football League and many aspects of the club's operations will have to be reviewed. "It is always a sad time when players move on from the club and we would like to thank them all for their efforts on our behalf." What do you think about these departures from Wrexham? Wrexham fan Roberts returned to his beloved home-town club two years ago but it has hardly been a heroes return. Last year Wrexham only managed to stay up on the final day of the season while this campaign has been the worst in their history. Fans' favourite Williams, like Roberts, was also born and raised in the Wrexham area and was in his second spell at the Racecourse Ground. Llewellyn, who also returned for his second spell at Wrexham in the summer of 2006, has been linked with a move to League One new boys Peterborough United.